Do you have a favorite day of the week? Most of us do; for me, no questions asked, it is Sunday. As a kid, growing up in southern Indiana I loved Sundays. We would be up early…but not as early as the rest of the week, travel down highway 45 to Greene County, to Little Cincinnati Christian Church; then back home for a great Sunday dinner. Later on, one or both of my siblings might come by and we would have tacos, etc…and finish up the day with everyone watching a Sunday night movie; lots of good memories. Today, things are a much faster pace. Not a good thing. Sunday is still a day where I get to slow down…and that is why Sunday is for sure my favorite day of the week. I love to visit with some of the same folks at church; SOCC is a great place and I always leave feeling a little more energized than when I walked in. Just the drive to church is good as I look for turkeys along the way and take the time to notice nature and all its grandeur. Afterwards….when others are settling in to watch baseball, football or simply do nothing…I switch into high gear and go in search of water and fish. I have simply fell in love with smallmouth bass this past year, finding hole after hole and spring creek after spring creek full of fish, anywhere from 8 inches up to a couple of fish that were over 18 inches. 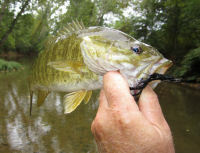 If you have not caught a smallie…you are missing out on a real treat as they fight like no other Indiana fish. Pound for pound smallies are the equivalent of trout and will test any rod, reel and line out there. This past Sunday I needed to fish and I needed to go fly fishing by myself. It is at these times that I think, relax and get my mind ready to go for yet another busy week of school, volleyball, parenting and life in general. I called dad and asked if he would drop me off at a point on one of my favorite pieces of water so that when I walked the 5 or 6 hours I would end up at my truck…and like usual he was up for the task. I truly love this stretch of water for it has deep holes along with soft ripples; almost this entire long walk holds fish of various sizes, among large Sycamores that have pools at their roots just perfect for the occasional lunker. As I neared the first deep pool I looked way ahead and could see ‘soft’ action in the hole, nervous water that tells me a bigger fish is lurking; possibly just moving out to feed off of an innocent bait fish that had swam too closely to its lair. I revved up my little 5’6” four weight Cabela’s TQR rod and double hauled a long line….allowing my black wooly bugger pattern to ‘kerplop’ down into the hole. I gave one sharp strip and once again allowed the forward weight on the fly to pull it down, two quick twitches back across the stream and another pause; bang, a quick and long strip set and immediately I could tell that I was in contact with a better fish. Big fish get big for a reason and this feller ripped across the pool toward the wad of roots exposed by lower water in the creek. I applied some graphite to the situation and the small rod bent…I gave several hard strips and moved the fish out of the danger zone, got the line onto my reel and at that point new I was in control. I played the fish for a minute, the power and beauty of its copper color in the clear water is hard to describe. I could see my black wooly bugger in the corner of its mouth and knew that for a moment I had fooled this trophy…it gobbled up my hand tied fly thinking it was in for the meal of the day. As I slowly placed the 15 incher back into its pool I could feel the stress of a busy week flow out of my hand and into the pool with the fish. I took a moment to soak in the full package of the serenity I was standing in…no question for me who is in charge; the palate of colors was a prelim to the fall foliage that would shortly be upon us and I hope that once again, this great fish and I can do battle. I hope you too have a favorite day….maybe Sunday is also ‘your’ day. Grab your gear and venture out and give nature a chance to boost your spirits as we all Enjoy the Great Outdoors.